One of Alberta's best-kept secrets is the Elkhorn at Falcon Crest resort, located west of Calgary and just a few minutes’ drive from the entrance to Banff National Park in western Canada. This year-round vacation destination offers guest the cozy comfort of uniquely designed and furnished timeshare studio suites with accommodations for up to four individuals per unit. Adjacent to the finest winter skiing in the region, river fishing, boating and rafting, and popular hiking trails, this is the perfect getaway destination for anyone who hears the outdoors calling their name. With a professional staff dedicated to personal service, plenty of on-site and off-site recreational opportunities and lots of convenience features such as outdoor hot tubs and a world-class fitness center, Elkhorn At Falcon Crest is a popular vacation property. 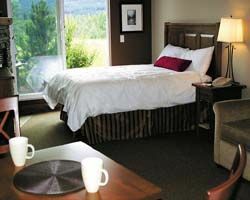 These Canmore timeshares for sale offer individuals or groups the opportunity to own a shared title of one of these fabulous studio suites. The studio guest suites at the resort are completely furnished and include a gas fireplace, large-screen TV with cable or satellite reception, DVD player, and full kitchen appliances. The living areas provide access to an outdoor balcony equipped with a gas barbeque grill. The bathrooms include a full tub or shower stall and complimentary amenities. The bedroom areas of this open concept unit are furnished with a king or queen bed, and the living room sofa opens up as a sleeper. Depending on the furnishing arrangements, the units sleep from between two and four individuals. The Elkhorn at Falcon Crest boasts a fitness and recreation center and well-maintained outdoor hot tubs. Grocery outlets are located near the resort complex, and several of the tour operators offer free shuttle service at all times of the year. The town of Banff is one of Canada's most popular destinations for tourists, and during the winter, the town is alive with festivals and concerts to keep the skiers entertained after a day on the slopes. The resort is maintained by a property management company, but the individual studio suites are privately owned. These can be rented on available dates or purchased from the current owner. 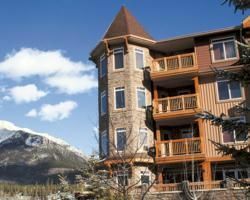 Canmore timeshares for sale at Elkhorn At Falcon Crest offer guaranteed access to this wonderful property and interested parties can even exchange their allotted timeshare dates with other resort properties through an exchange company. Contact Elkhorn at Falcon Crest Specialist Today!